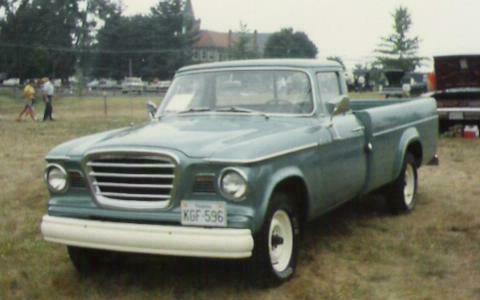 This 1962 Studebaker Champ Pickup belongs to Don Fitzsimons of Grottoes, Virginia. The Champ used the same front fenders, hood, doors, and dashboard as the early Lark which gave it an attractive car-like appearence. Champs had a heavier grille than Larks and a truck front bumper. The chassis was basically the same as used on the C Cab models. Early Champs came with the same narrow pickup box as the C Cab, but a more modern looking wide box was introduced as an option in 1961 and made standard in 1962. 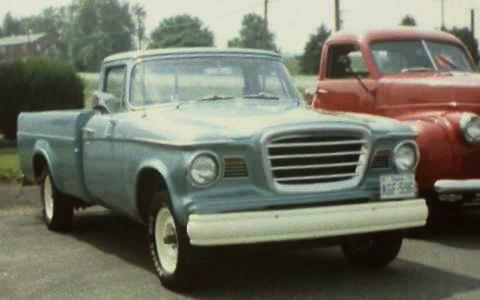 Studebaker bought the tooling for the wide box from the Chrysler Corporation and adapted it to the Champ. Both "short" six foot and "long" eight foot boxes were available. A nice Champ option was a split sliding rear cab window. If you look close, you can see that Don's truck has this feature. 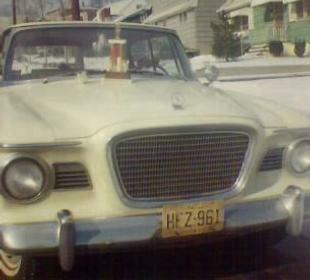 This is the 1959 Lark Regal Hardtop that I drove in the mid-1960's while in college. It was a six cylinder with stick shift but no overdrive. It had the nice optional pleated vinyl interior but no radio. Since the car was only a few years old when I bought it, I was able to have a new Motorola radio installed that was designed for this model. The Lark was used to compete in local time-speed-distance rallies with some success. This winter picture was taken with a couple of rally trophies on the hood. 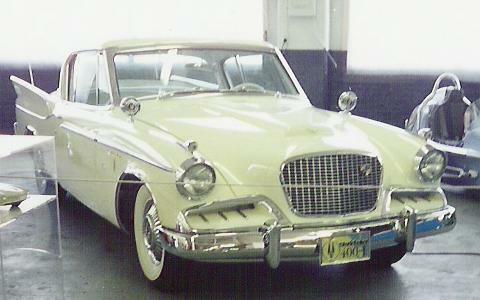 The Golden Hawk 400 was a limited production model that featured upgraded trim and a full leather interior. Differences from the standard Golden Hawk included a bright band across the roof and integrated arm rests as used on the 1956 Golden Hawk. 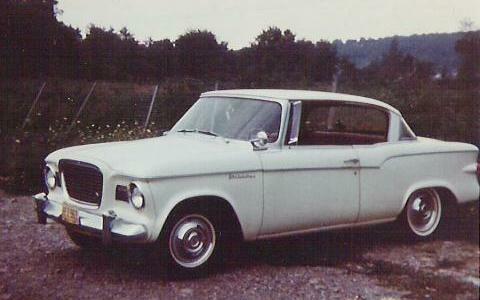 Otherwise, it was powered by the same supercharged 289 cubic inch V8 as the regular Golden Hawk. Only 41 Golden Hawk 400's were produced, perhaps due to the $4,208 list price. This picture was taken during my August 1994 visit to the Studebaker National Museum in South Bend.